Apatura is a stylish restaurant in South Croydon that distinguishes itself from the many other fine eateries in the area with a classier, sexier vibe. The place is split in two: at the front you have a well-stocked bar with lots of cocktails and nice comfortable leather seating, and just past the front is the main restaurant, which is suitably packed when we visit on a Friday night. We are greeted by restaurant manager James, who is warm, friendly and clearly passionate about the venue. It is not hard to see why. Apatura has slick decor that feels very modern yet manages to retain a warm and local vibe. The ceilings are high, allowing for big windows that let in lots of natural light. Its look wouldn’t put it out of place in a gangster film like Scarface or The Business, and would fit right in on the streets of Miami or Marbella, which makes it stand out in Croydon. Apatura has been around for five years and is a family-run business that depends on its customers coming back again and again, which they clearly do. The menu is a mouth-watering fusion of Mediterranean and Tex-Mex dishes. The starters include homemade quesadillas, baby pork ribs glazed in a smoked BBQ sauce, nachos with beef chilli or BBQ chicken, and potato skins with cheese and pinto beans, cheese and smoked bacon or beef chilli. There are also vegetarian, meat and seafood sharing platters. We have a hard time deciding what to get from all the options, but settle on the garlic tiger prawns and the homemade kofte. The mains encourage repeat visits. The fajitas have a great variety of fillings, from simple mixed vegetables, chicken breast strips and beef steak strips to salmon fillet and garlic sautéed king prawns. There are also other Mexican classics like enchiladas and a beer chilli, and there’s the gorgeous-sounding Apatura risotto, which includes tiger prawns, diced chicken, chorizo and mixed peppers. Fish options include pan-fried sea bass, salmon fillet and tuna steak, and the bustling grill offers 28-day dry-aged sirloin, rib-eye and fillet steak as well as a chargrilled chicken sanduba (a Brazilian sandwich) and a classic chicken shish, amongst many others. 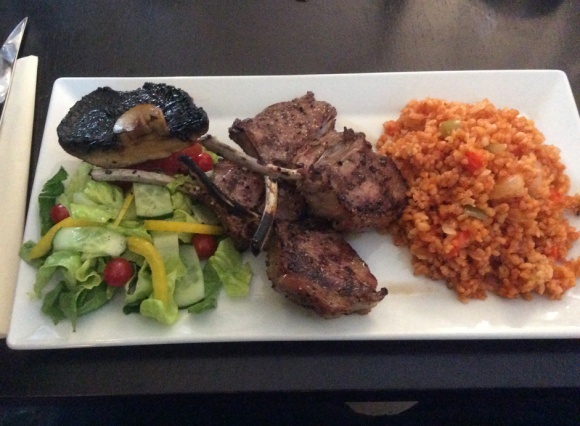 We opt for the lamb cutlets served with bulgar wheat and the crispy pork belly. The cocktail list is huge, but we go for an exclusive concoction, the Jem and Terry (named after the couple who own the place). The cocktails are well presented (with a small flower resting atop the sturdy jar), strong and most importantly absolutely delicious. My prawns arrive – they are huge, soft and just pop out of their shells. The accompanying salad is fresh and crunchy, with just a light dressing. The kofte is perfectly cooked and succulently juicy, avoiding the dryness that can sometimes be a problem with this dish. Portions are just right – not too big but by no means stingy. The starters are of a high enough quality to make us excited for the mains. The mains arrive right on cue. Timing is everything in Apatura; the dishes arrive at just the right time and have clearly come direct from the grill. 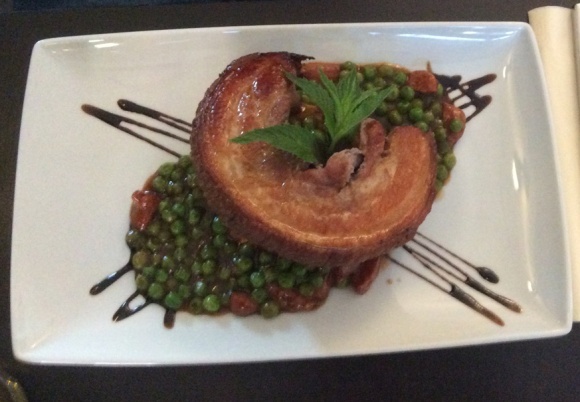 The pork belly is served in a red wine sauce and is filled with chorizo. It is a well-rounded dish with, lots of different flavours complementing each other beautifully, and the accompanying mash is spot-on. The lamb cutlets arrive piping hot and are perfect hunks of meat, moist but firm and seasoned to perfection. The bulgar, like everything else here, is done very well; it’s spicy, soft and fluffy, and just itching to soak up the flavours from the lamb. Despite being quite full, we can’t resist ordering dessert. 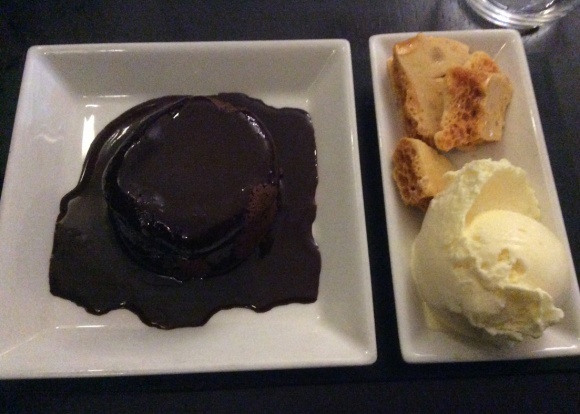 We go for the Eton mess and the chocolate fondant, which are both made from scratch and perfectly crafted. The Eton mess is very creamy, with huge chunks of lovely meringue, while the fondant is indulgent in a way that truly lives up to that oft-used word – warm, fresh and firm, with its hot melted chocolate centre just oozing out. It is served with a creamy vanilla ice cream and crunchy homemade honeycomb. Apatura really cannot be recommended enough. If you live in south London, it’s certainly worth a trip to leafy South Croydon to visit this great family restaurant, which feels glamorous and romantic but also friendly and inclusive.